The Read Aloud Series by author Da Poppins features all the info and tips you need to incorporate the magic of reading into your routine with kids. Click this box to see the rest in the series. Despite not having a great deal of spare time on my hands these days to escape into as many books as I’d like, I am a keen book-worm. So it’s no surprise that I’m a big supporter of reading and of the importance of nurturing children’s literacy. I also try my hardest to encourage the same love and appreciation for books in my charges, and artfully schedule reading time into our regular routines. To kick off this Read Aloud series, I’m excited to have guest contributor Da Poppins here again (who featured in the first column of the Nanny Spotlight series). I’m so glad Hope asked me to write about the benefits of reading, and of the value in reading aloud to your children. I find it has such a positive effect on children of all ages, with many encouraging results. Over the years most of the families I have met as a nanny had a routine that encouraged reading aloud. Incidentally, all of those children went on to excel at reading in later school years. Plus, I’ve also seen the positive influence of reading aloud in my own kids. In my opinion (and shared by many others; Jim Trelease, Pam Allen, Dr. Pamela High, Norah Colvin), reading out loud is one of the most important keys for success in school, and is the best way to facilitate good reading skills in your children. “Children are made readers on the laps of their parents.” – Emilie Buchwald. The benefit of reading aloud is that it not only dramatically enhances their development and education, but that it also entertains. Another bonus to this entertainment is also that it’s free, especially if you have a library membership. And if your child is anything like me, a good book only becomes better each time it’s read! It’s recommended that you should read aloud to your children for a minimum of 15 minutes each day. That’s 15 minutes for every child, every parent, every day. 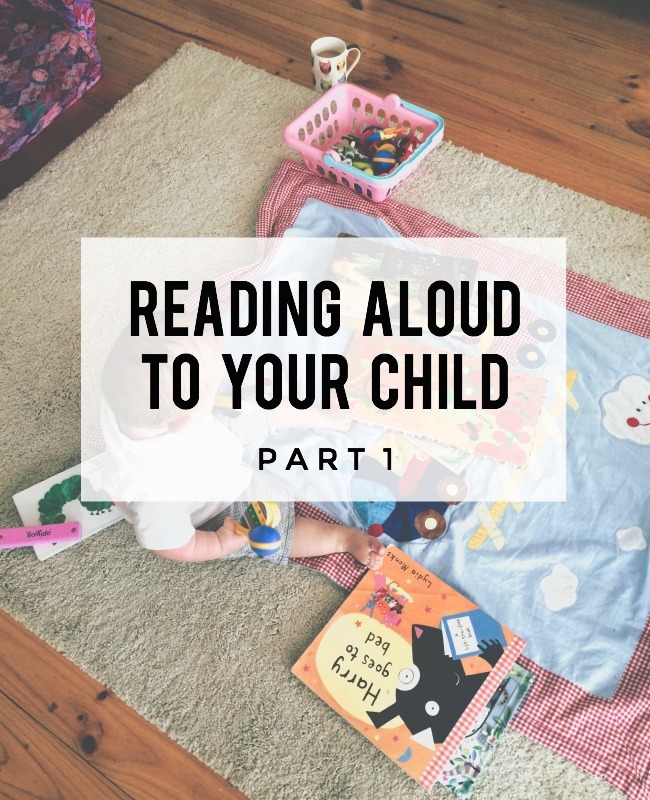 Mem Fox, author of Possum Magic and other memorable children’s books, expands on this in her ten commandments for reading aloud and suggests to start reading books to babies the moment they are born, and to keep reading numerous books every day. For babies, toddlers, and infants, it’s best to start small when reading aloud. You can break up that 15 minute block into smaller chunks between each little “That’s Not My…” book throughout the day. So What Does Reading Aloud Achieve? The joy of reading aloud to your child is that if incorporated into the nightly bed-time routine, you can leave the events of the day behind and settle into a good book. Their freshly cleaned, pajama clad bodies can snuggle into you whilst their eyes grow heavy, and listen to the sound of your voice weave a magical story from words on the page. Reading aloud helps children build a stronger foundation for school success. Almost all teaching in the younger years at school, particularly in the kindergarten level, is oral. So it’s natural then that children with a larger vocabulary will benefit greater. A good read aloud book opens vocabulary doors! Reading aloud is a proven method to help children cope with stress and tragedy. A good story also helps draw attention to the feelings of others by bringing characters emotions, feelings and thought processes into the story line and allowing children to align themselves with their character of choice. A good read aloud book will not only introduce new vocabulary, but also introduce new concepts. It can help to establish a sturdy foundation for how children deal with and process issues. For example, with younger children we often rely on books to aid with the introduction of new concepts such as potty training, religious beliefs, and the rite of passage that is ‘going to school’. Reading aloud stimulates language development even before a child can talk. It also assists children in the development of wider social skills, and builds motivation, curiosity and memory. Plus, reading aloud gives children the opportunity to practice their listening skills, which is fundamental to the school environment. Reading aloud helps children to develop a positive association with books and reading. If you foster and environment in where your children possess a persistent hunger for knowledge, their growth, education, and acquisition of knowledge can only be enhanced. The best overall achievement in my opinion! They may learn to read better, think better, imagine more richly, and become a passionate and lifelong reader. But perhaps most of all, it’s that benefit and enjoyment of spending time with them! In other words, that evening story you find yourself having to read every night, the one that’s more than likely seen better days and showing signs of over use, that book is doing your child a favour. No matter the age, or how tired they are, or how busy you are, always make time in your day for reading. Even if it’s simply to read The Gruffalo out loud for the 100th time to the four-year-old who could recount if by rote herself, do it anyway. Your kids will thank you for it when they’re older. Reading aloud to your children is an early advertisement for books. >>> Do YOU read aloud to your children each day? Dana, Da Poppins, is a professional career nanny based in Vancouver, Washington, a graduate of the prestigious Northwest Nanny Institute and has over 20 years experience in the industry. Dana is a strong advocate for the benefit of reading and children’s literacy, is a talented scrapbooker, and writes the blog Da Poppins. Great post. I enjoy taking a few minutes out to read to my kids. i love it actually. It does pay off my older ones read really well for their ages. I need to squeeze books into my day more. Not just for the kids but me too. I miss books. I think school robs you of some of these preschool pleasures. Tomorrow the toddler and I shall read together! I need to read more. I really do. I just find reading time gets lost in the business. I need to make it happen. Great article. Totally agree – I love reading time with my son and mainly for the bonding time. It’s our special time at the end of our hectic days. And I love that Emilie Buchwald quote. I loved reading out aloud to all three of my children and I continued to do so daily for many many years. With my 11 year old we still sometimes read together (but more on a weekly or fortnightly basis than a daily one) and more for a shared love of books and companionship, because he deifinitely doesn’t need me reading to him. We actually take it in turns to read a couple of pages to each other. It’s also interesting how my 14 year old will often come and sit down next to us to listen as well! God I love children’s books! Can’t get enough of them. I started reading to my son when he was a baby, beginning with The Tales of Peter Rabbit, A.A. Milnes When We Were Very Young and various Dr Suess, but now that he is 2 he is only interested in non story books I.e numbers,shapes, colours, alphabet, opposites. He actually closes other books on my hands, though if I am very lucky I can get half of a Hairy MacLary or Where is the Green Sheep in! I love the time I have reading aloud with my children and have done it since before they were born. At the moment as they learn to read we are sharing the reading and I love this next stage too.